Whether you’re a teacher who wants to send supplemental information to your students or a business who wants to automatically send a whitepaper to new mailing list contacts, this new feature should come in handy. 1. 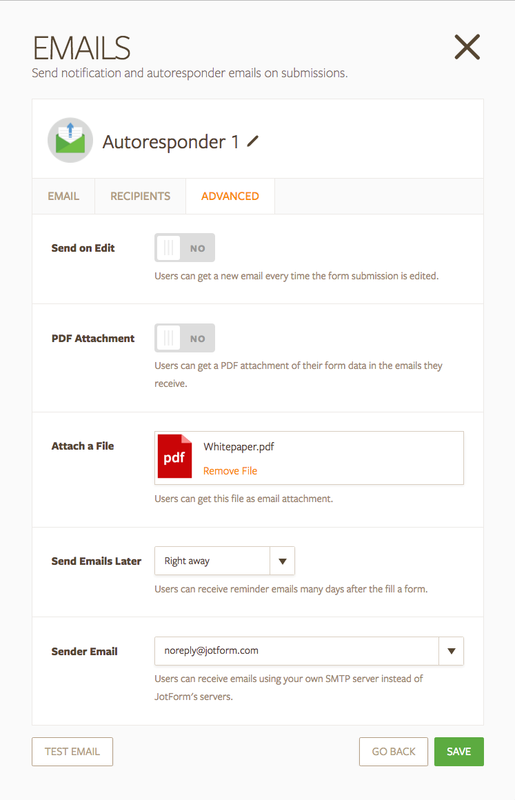 Select the form for your Autoresponder Email and click More. 2. Click on Emails to see the setup wizard. 3. 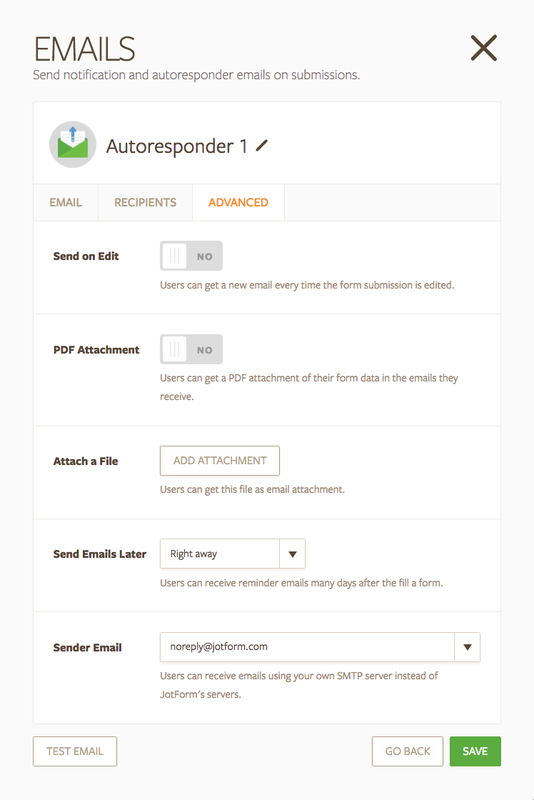 Create a new Autoresponder Email or edit an existing one. 4. Under the Advanced tab, you’ll see a field labeled Attach a File that allows you to upload an attachment. 5. Upload your attachment and click Save. I have followed the directions above. However, the attachment is not coming through in my Test Email. Thanks for your help. Could you please add a "ContentId" header when sending the attachment? This way it would be possible to embed the attached file into the notification email via and prevent blocking of external images in the email body. What types of files can be attached? I’m trying to attach a voice recording to an auto response email that is a m4a file type and it will allow it. Also what is the max size for a file? Yes I know that. I did it and it failed to send the attachment in the auto response. What it did was send a PDF of what I filled in. The file “Terms & Conditions.pdf” could not be opened because it is empty. I do not the option "Emails" as you mentioned in the 2nd step. If I need to check anywhere else where I can find the Emails option please let me know. Can I add more than one attachment? I don't see this option but would like to do so if posible. I have enabledthe attach file feature. I also closed the form and opened it again. I got a message the file type wasn't supported when attaching an Excel file? When I send myself a test email the attachment isn't there. Does this mean that the attachment hasn't worked? Can I attach multiple files? Zipped file not supported. I'm prefer 2-3 pdf files to attached in to the autoresponder email. Regards. I can't find this feature please help? after I embed a code I want it to say the title of my form not show the code. I want it to be a link. How do I do this? My form does not show attach a file field. What's the easiest way to send a form via email to a client? Keep in mind I don't understand exactly what you mean by autoresponder.